The rumors surfaced Tuesday when another contestant, a woman by the name of Dr. Phyllis, mysteriously gained more than 300,000 votes, surpassing the previously first placed Anner in 20 minutes. Both contestants now have more than four million votes apiece. 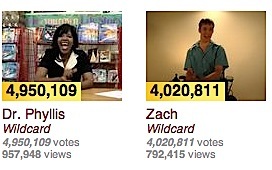 All votes aside, Oprah needs Zach Anner and so does the world. She should find a way to bring him on board regardless of the results. Anner is cute, funny and gives a fresh take on life. Anner has the potential to crack open the injustices and inconsistencies for the disability community on a stage built by the word’s most famous talk show host. Viewers will be blown away by how difficult it is to travel with a physical disability within the U.S., let alone places like Europe and Africa. Wheelchairs that get knocked around in cargo. Travelers whose chairs cannot fit through the doors of hotel rooms, or give enough room for a chair to turn around fully. Showers with too high of a “lip” so that a chair can’t roll in. Transfers (from chair to bed) that break in mid-air. The list goes on. Tourist attractions with no accessible bathrooms. Places steeped in history, such as Paris and the French capital, that have architecture making it difficult to maneuver (and local attitudes don’t help.) “The biggest problem that exists worldwide is the lack of accessible ground transportation,” says Candy Harrington, author of Barrier Free Travel and 101 Accessible Vacations. Wheelchair users who cannot find an accessible cab often must resort to a van or livery service, at a much higher cost. 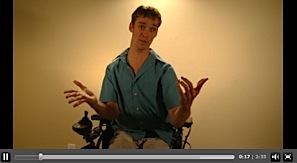 Watch Zach Anner's OWN audition video. Situations like open contests are difficult for people with disabilities to compete in. The very nature of a contest weeds out weak performers, especially If there’s a preconceived notion that someone is physically or mentally unable to carry the torch. It happens in showbiz, in sports and in the job market. Anner won four million votes. He deserves an opportunity to make us laugh, cry and see the world in a different light while peeling back the intimate layers of traveling with a disability. (Vote for him here.) It won’t be pretty, but he’ll give viewers one of the most rewarding experiences on TV. And that’s something Oprah can truly OWN. Hey America! Uh, my name is Zach, I’m from Austin Texas. I think we met at Janine’s party once and we really hit it off but I think we should get to know each other a little bit better. And I heard Oprah was giving away a show to somebody that really really wanted it and had something to say. And I’ve got a lot to say, but I didn’t know exactly where I fit because I have something called cerebral palsy (which I believe is the sexiest of all the palsies) but it does sort of limit where my strengths are. I tried a cooking show, and normally when I cook I set my pants on fire and this didn’t go any better. The next thing we’re going to learn to cook is TAKEOUT! The health and well-being, yoga was… interesting. This isn’t yoga, I’m just putting on pants. America doesn’t want to see this. Fashion, I felt, I was really good at. You know, like, I could do a lot of that. But I don’t know how the rest of the world would feel. I decided that what I really wanted to do was make a travel show for people who never thought they could travel, and inspire people to go on an adventure. Cuz I feel like so many travel shows are about how to plan the perfect vacation, oh, go to the perfect restaurant. “Oh, hey Bono, how’s it going, I didn’t expect to see you here!” My travel show would be about how to have a perfect vacation when things don’t go as planned at all. “Oh no, all our stuff was stolen!” “Oh, we’ve got to figure out a way to climb up this mountain.” You know? And this would be something to prove to people that no obstacle is too big, no mountain too high, no volcano too hot, and no Atlantis is too underwater or fictional. We’re just going to go on the craziest adventures we can and whatever we encounter, we’re gonna have a great time. As my mom always says, when life gives you wheelchair, make lemonade. I don’t know what she meant, but I’m going to take her advice. So if you’re ready America, let’s go on an adventure together! All right, I’m ready! Perfect! Let’s go! geekosystem.comThe controversy has made it to the front page of CNN, and they link to an explanation of the fraud allegations on http://www.geekosystem.com/zach-anner-rigged-votes-oprah/ . It seems that the vote button code for “Dr. Phyllis” was different than that of the other contestants for a period of several hours, and that corresponded with her surprising jump in votes. If Oprah’s programmers were tasked with altering the votes, I’m quite sure they would have done so in a way that did not alter the client-side code.